Astringent, detoxifying and toning. 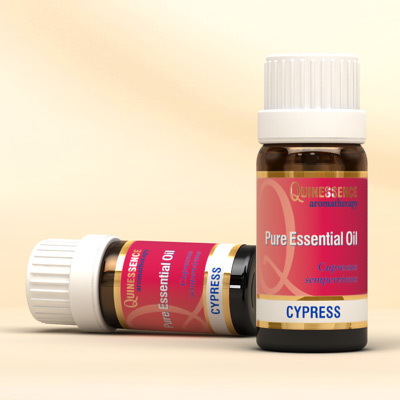 Of all the oils currently available to the aromatherapist, Cypress Essential Oil is the most effective vasoconstrictor, and is unbeatable for reducing broken facial capillaries or varicose veins. The vigorous astringent action of Cypress Essential Oil also helps rebalance oily skin when blended in a cream or lotion base. Cypress oil has a detoxifying action that can be put to great use in massage blends for reducing cellulite and in detox treatments. For best results use it with juniper berry, sweet fennel or grapefruit essential oils. It’s also a natural deodorant that’s invaluable for treating excessive perspiration and sweaty feet! Cypress is an effective antibacterial essential oil that can be utilized during the cold season, and it is especially useful when vaporized as it delivers welcome relief to a tickly cough because it acts as a sedative to the respiratory nerve endings. It is an excellent choice during the menopause for hot flushes as well as during the monthly cycle where it can be helpful with dysmenorrhoea.